Is your organization already GDPR proof? Are you looking for a third party to the GDPR Compliance Implementation for your organization? This Application Form GDPR Certification will provide all the details need to get a quotation from a Third Party. The complexity of the newly introduced EU General Data Protection Regulation (GDPR) might require your organization to ask a Third Party to implement the changes for your organization. Considering its the most important change in data privacy regulation in the last 20 years, this is highly possible. This GDPR policy directive was adopted in May 2016 because most Europeans say they want the same data protection rights across the EU and regardless of where their data is processed. It aims to make Europe fit for the digital age. According to the GDPR, an international organization is defined by the GDPR directive as “an organization and its subordinate bodies governed by public international law, or any other body which is set up by, or on the basis of, an agreement between two or more countries” (GDPR Article 4). 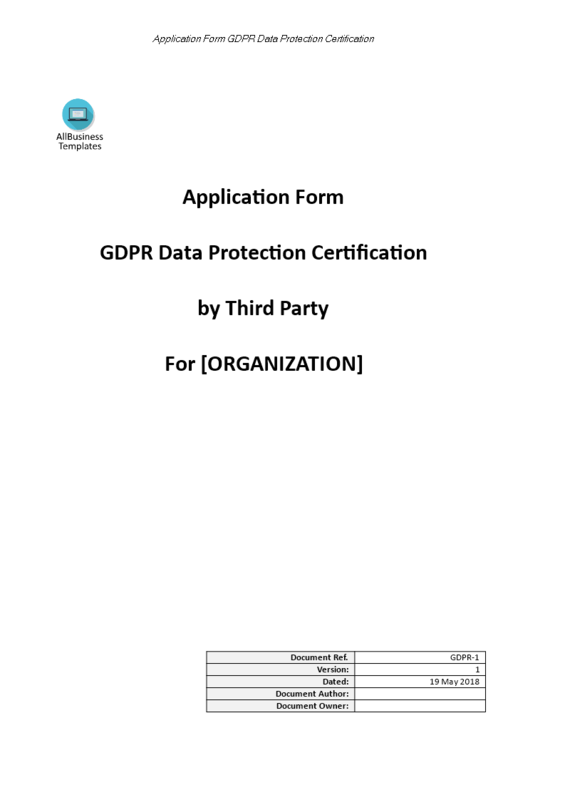 Download this Application Form for a Third Party GDPR Certification Implementation now or check out our fit-for-purpose GDPR Complete Compliance Kit templates here! The document(s) will be available to download immediately after purchase.